Which Cabinets Wood You Buy? Are you looking for kitchen cabinet design ideas, but overwhelmed by the selection and don’t know where to begin? In this situation the old adage comes to mind, “never judge a book by its cover.” Here are a few things to think about that can make your decision a little easier and more educated. There are many types of wood species, but as far as cabinets are concerned, the most commonly used are Oak, Maple, Cherry, Hickory and Birch. Keeping this in mind, some of the key factors when choosing cabinets are durability, cost and appearance. How much wear and tear will your cabinets need to withstand? Is your kitchen a high-traffic area with lots of cooking and kids running around constantly? Or, is it simply a little haven to drink wine? Hickory, Maple and Oak are all very durable choices and will help hide the nicks and scratches over time. If your budget is a deciding factor, you are better off to choose a species that is more popular and common, such as Oak or even Pine. 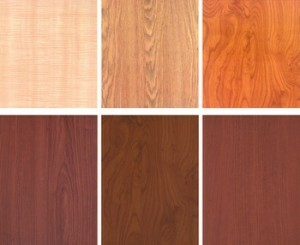 The more rare species, such as Cherry, Walnut and Hickory will surely drive up the price. So if you really do only drink wine in your kitchen, you may make your decision solely based on looks. In this case, your kitchen remodel choices are endless. One thing that will help is to know the different wood grains; open, medium or closed. The more open grains, such as Oak and Hickory, have more texture to them which is great for a casual and cozy feel. The more closed grains, such as Cherry and Maple, lead way for more of a rich, sophisticated and elegant look. If you are still not sure, stick with Oak. This is a great standard among the cabinet species. Oak gives you a good price and a wide array of colors. There are plenty of variables when it comes to choosing the right cabinets for your kitchen remodel, but this should get your wheels turning in the right direction.